The Agricultural Justice Project is a project in which RAFI is a founding member and partner. 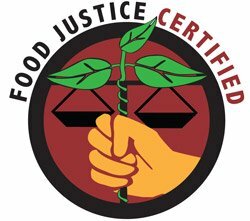 AJP’s Food Justice Certification label launched with RAFI’s support in 2011. The label sets rigorous standards for the respectful treatment of farmworkers, living wages, safe working conditions and collective bargaining rights. With this label, consumers can trust that their food came from a just source. As of 2013, the label can be found in 60 Whole Foods stores nationwide. Swanton Berry Farm group photo courtesy of Swanton Berry Farm. Below is an interview with John Cochran, owner of Swanton Berry Farm in California. It was conducted by our friends at CUESA (Center for Urban Education about Sustainable Agriculture) and posted on their blog on Feb. 28, 2014. By Brie Mazurek at CUESA Swanton Berry Farm has been a leader in the sustainable food movement for more than 30 years, pushing boundaries for environmental stewardship as well as social justice. 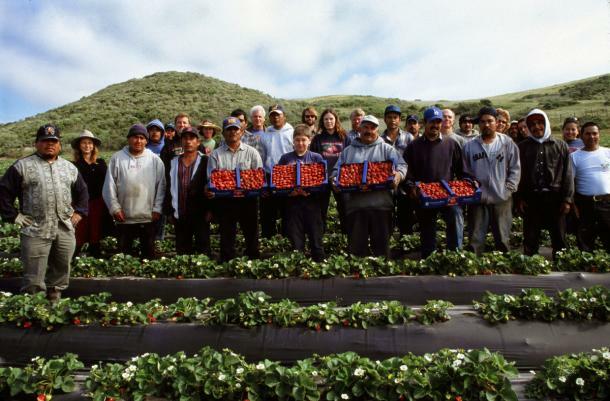 Not only were they the first organic strawberry farm in California, but they were also the first organic farm to sign a contract with the United Farm Workers, in 1998. This month, Swanton Berry Farm became one of four farms in the United States to receive the Agricultural Justice Project’s (AJP) Food Justice Certification label. This certification has been a long time in the works for Swanton, and the farm has worked closely with AJP to help them develop their protocols. “Farmer Jim Cochran is deeply committed to social justice, for the people who work on his own farm and on all farms,” says AJP co-founder Elizabeth Henderson. “He has helped the Agricultural Justice Project by allowing his farm to serve as a guinea pig while we developed our program.” We spoke with Swanton co-owner Jim Cochran to learn more about this new certification and the future of the domestic fair trade movement. CUESA: Can you tell us about the Food Justice Certification process? Jim Cochran: The AJP looked at paperwork, talked to managers, and talked to employees when the management was not present. For those interviews, they brought along former farmworkers, so our workers could feel comfortable talking to them. A farmworker knows what probing questions to ask, so they are good at figuring out what the conditions are like. Talking to field workers about their experience is better than just asking someone like myself, because I could just be painting a rosy picture that isn’t accurate. As with the organic label, Food Justice Certification is a whole philosophy. Just as the organic method is not just about using organic inputs, but it’s also about understanding soil ecology, the farming environment, and water, it’s similar when you look at social or labor issues. You have human beings who have families and needs and wants. It’s a complex fabric. CUESA: Why do you see a need for a social justice label like this? JC: In my opinion, having organic certification is only half of the equation. It gives some assurance that the farming practices are in compliance with the philosophy of organic farming, but it doesn’t address labor practices and working conditions. I think labor certification is going to become increasingly important. There are many people on the farm doing the harvesting, watering, cultivating, record keeping, and other farm work that the public doesn’t see. People are concerned about whether their clothes are made under sweatshop conditions in other countries, but they’re not thinking about these issues here in the United States. This label is a step in the right direction. 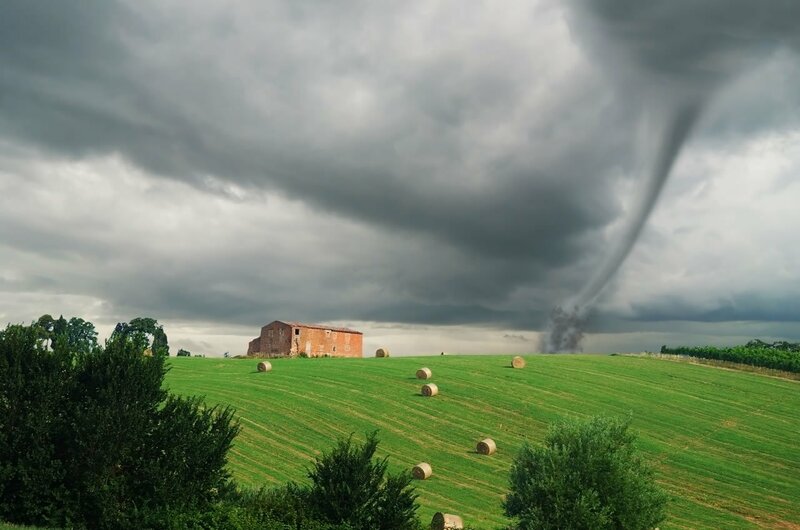 I’m sure there are farms that are doing a terrific job in this area, and having a certification program can provide customers with some assurance. CUESA: How does this certification fit into Swanton Berry Farm’s mission and operation? JC: When I started growing strawberries organically 31 years ago, there was nobody else who produced organic strawberries in California on a consistent basis. It took me 15 years to figure out how to grow the strawberries at a reasonable price, but the next step was figuring out how to improve our employee benefits packages. We’ve had the union label for 15 years or so now, and in a way, that label is a certification for us. Every year, we discuss with our employees how we do things and work on figuring out how to do things better. CUESA: What are some of the challenges Swanton and other farms face in providing such benefits for farmworkers? JC: The part that’s difficult for us is the cost. Every time you hold a meeting or training for your employees, that costs money. We pay health insurance, vacation and holidays, and pension plans, which also cost a lot of money. It’s over $2 an hour in additional costs. Our labor costs are quite high, but we don’t charge any more for our fruit. Conventional growers who get twice the yield but don’t offer those benefits might charge the same price or slightly lower. We operate on a 2.5% profit margin. It hasn’t been easy. We have a very narrow margin, and we depend on the loyalty of our customers. CUESA: Some farmers feel that they can’t afford to offer better wages and benefits. How have you been able to make things work on your farm? JC: You have to be very efficient. That’s not easy to do when you’re growing a lot of different kinds of crops. If you’re growing mainly strawberries like we do, you ought to be able to pay for benefits. We don’t own any land. If you buy land, you probably can’t afford to pay your employees health insurance. And in my opinion, what’s the point in that? My feeling is that you need to expand slowly. It’s probably not possible to do in the first five or six years of farming, but after that you have to say to yourself, “Why am I not able to pay my people better? Maybe I need to charge more money for the crops, or drop some of the crops that don’t fit in efficiency-wise to what I’m doing.” In working on these issues, farmers might find that their productivity gets better. I’m about ready to give our employees another raise. With a 2.5% margin, that’s a little scary. But every time I’ve given a raise, it’s always worked out. Retention improves, and people are happier. CUESA: How can eaters and farmers contribute to this movement for better labor conditions? JC: Support us at the market! The prices we get at Ferry Plaza and other farmers markets are good prices, and that’s really what makes it possible for us to pay the health insurance and other benefits. Customers shouldn’t have to eat bad strawberries in order to support good labor practices, so we try to produce a superior product. It works out for everyone in the long run. It’s only in the last two or three years that you hear people talking about worker issues more, and I’m happy for it. I hope that raising awareness will spark some other farmers to start thinking about them as well. I’d be happy to talk to any farmer who wants to give me a call and ask me about our practices. Our purpose in going through this program is not to highlight ourselves as better than other farms but to get the ball rolling on something that we hope becomes more widely adopted. “This technology is porous,” says RAFI Just Foods Program Director Michael Sligh.